I’ve been working insane hours lately – waking up at 5am, spending an hour on the subway and starting work at 7am, getting off anytime between 5pm-7pm, taking the subway back an hour, and going to bed by 9pm or 10pm. Not much else to do but work, eat, and sleep. But for the past week I’ve had off while people pay $10,000 plus an hour to skate at Yankee Stadium. The first part of the week I went to Las Vegas with one of my best friends to belatedly celebrate my birthday. We both are dating pilots at the same airline so got to enjoy traveling with someone who knows the pains of flying non-rev. We constantly have to remind ourselves: we’re lucky to fly for free, even if all the flights are oversold. I came out to where she lives a day early because the flights from EWR to LAS weren’t looking good for me the next day. Upside to that, I got my birthday presents! My two best friends are great and the only people who got my straight up flying gifts either for my birthday or Christmas. My best friend from college bought me an ornament for Christmas with my name and the plane I learned to fly in pained on it – the exact colors, but wrong N number – it was so cool. For my birthday, I got TWO great books. I, of course, started reading The Powder Puff Derby of 1929 that night, on the airplane, and spare moments I had during vacation. It’s a GREAT book and I highly recommend it. It’s non-fiction, but written more like a cohesive story. It follows the race day by day and all the extreme events that happened. It’s amazing what these women went through and still finished the race. I have to admit, I’ve been quite bad about learning about other female aviators besides Amelia Earhart. This book had Amelia Earhart, but told me so much more about nineteen other women pilots of the day. It covered Louise Thaden a lot, and I love her now. There are so many other greats though: Pancho Barnes, Marvel Crosson, Blanche Noyes, Ruth Elder, etc. It’s well worth the read to learn about these courageous women. Not only women aviators are mentioned but Will Rogers plays a big role, you see Howard Hughes before he flew. It’s amazing how all these people knew each other, it must have been an amazing time to live in. I told Jake, in 2029 I want to fly the race they did. I would hope The Air Race Classic would make the course the same that year. He told me we can’t even plan next week, how can I plan something 15 years away? That is just a stipulation! 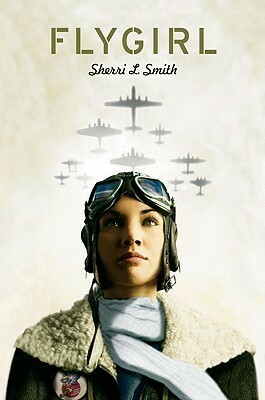 The other book my friend gave me will probably be a sit down every few days and read about one female aviator at a time. 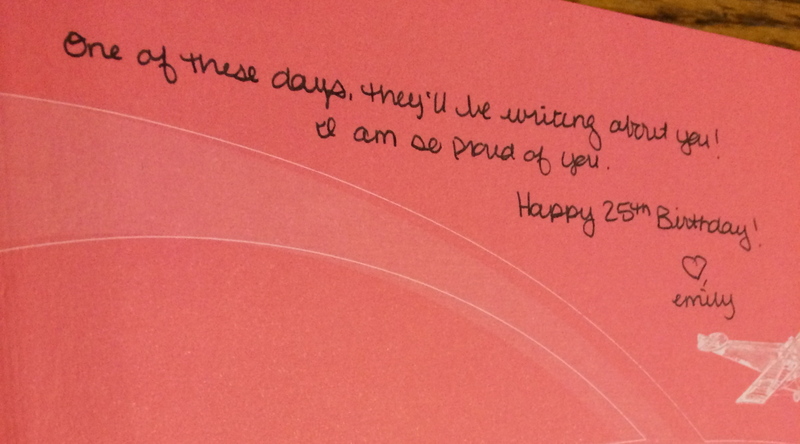 She wrote an amazing message on the inside cover. I hope I can live up to her expectations of me. 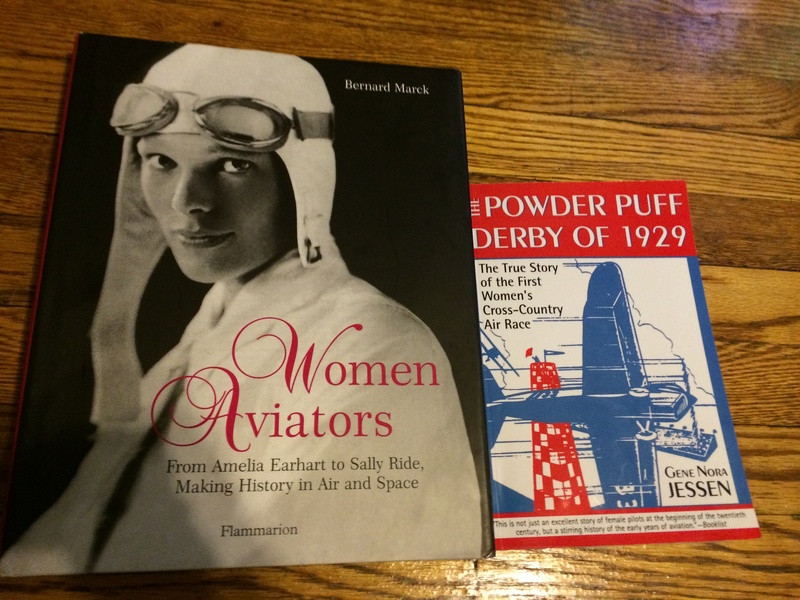 In the back of The Powder Puff Derby book, the author did cover a lot of other female pilots. Patty Wagstaff and Martha King were in there! I actually didn’t know a Patty Wagstaff plane was already in the Smithsonian, that’s so cool. And Martha King is the only woman to have every pilot and instructor rating. Thanks everyone for more suggestions to read on my last post. Keep them coming! I have a lot of commute time to read.